Through the ages young students have enjoyed listening to books read to them by their classroom teacher or school librarian. Because even very young students today are quite familiar with our new digital world, the time-honored practice of listening to a book may need new “hooks” for these young but media-savvy listeners. How can we draw our 21st century students into the analog magic of picture books? One way to pull them inside a book is to exploit the musical characteristics of the text along with movement that might be suggested by the text or purposely enhanced by the illustrations. 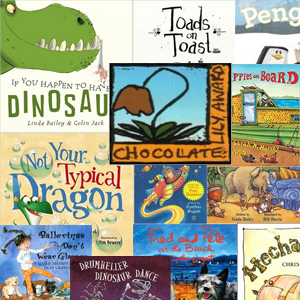 Many books for children use poetry as text, which not only makes the reading experience an artful one, but also makes the text memorable because it maintains a steady beat. Children feel that steady beat, which assists in their learning the text quickly, allowing repeated returns to the books on their own. Music and poetry similarities include beat (the stressed syllable), beat pattern or meter (the poetic foot groupings in Western poetry, i.e. iamb, trochee, dactyl, and anapest), and tempo, specified or implied (fast, slow, steady, slowing down, or speeding up). The rise and fall of the pitch level of the reader’s voice is naturally perceived by the ear as similar to the fluctuations in the flow of musical pitches in melodies. Often a book’s illustrations will suggest these fluctuations in pitch, sometimes the meaning of the text, or sometimes just the placement of the text on the page. These spoken pitch fluctuations often go hand in hand with the rhythm and meter aspects of the verse. Harmony in music is the tonal support of the melody – the guitar’s strummed chords that accompany a song (a story being sung). 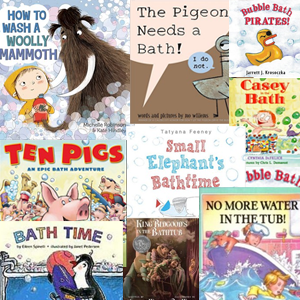 Parallels with picture books might be the various means for making word meanings and plot immediately obvious to young listeners, such as the way the illustrations and text interact, the size and placement of the text, the sizes of objects in the illustrations, or even the color of the type or colors used in the illustrations. All these elements are supportive of the story’s meaning and flow. Form in music is it’s architecture: A-B-A; A-A 1 -B-A; verse/refrain are a few examples. Form can be apparent in picture book texts, even those not written in verse form. Form can also be perceived in the flow of the story or plot line, and aided by illustrations. Verse-Refrain, Call and Response, and the basic Beginning/ Middle/End forms are most common forms in storytelling and picture picture books. In music, timbre is the quality or “color” of the sound, e.g. the difference between the sound of a violin and a clarinet. The colors of spoken sounds can be implied by the quality of the reader’s voice, the meaning of the text and/or the illustrations. Picture books and music have a natural and symbiotic relationship! Making those word/music connections part of the reading experience will pull young listeners into the story like a magnet! Let’s take a look at some picture books to see how uncovering their musical elements might increase your students’ engagement with these books. One of them has an action-filled daytime setting, and three are set at night, when books are often read at home. All three of these would be quite successful at allaying fears of the dark. Farmyard Beat, Lindsay Craig and Marc Brown. Alfred A. Knopf, 2011. It’s night time, but the farmyard animals are not sleepy! They can’t sleep ‘cause they’ve got that beat! And they all work together to make a barnyard orchestra that wakes up Farmer Sue. It’s easy to feel the strong/weak beats in this text and children enjoy patting the beat on their knees while listening to the story. Each animal group’s refrain is the same length as all the others,’ but with contrasting internal rhythms, and each line is repeated. The first few times the book is read, the students will be able to repeat each animal’s particular refrain. On the second or third reading the children will be ready to create a full barnyard chorus Grand Finale. Assign three or four children to make the sounds of a specific animal. Add each animal one at a time. At the end, all the animal groups will be speaking at the same time. This wonderful and only slightly chaotic chorus (cacophony?) works well because each animal group’s refrain fits neatly into a 4-beat pattern. In instances where the beat placement or volume might be uncertain, author Lindsay Craig helps us figure out where the beats are by using capital and lower-case letters, dashes, and exclamation points. This sample of a few of the farm animals shows how the sounds, when spoken and added one at a time, will work. The vertical lines indicate the steady beats. Another well known book by Bill Martin, Jr. and John Archambault, Chicka Chicka Boom Boom, also rides along a steady beat. While not written in a way that allows for an additive performance by students, as Farmyard Beat does, children love keeping the steady beat and chiming in with the all the “Chicka Chicka Boom Boom’s. When Mermaids Sleep, Ann Bonwill, Illustrated by Steve Johnson and Lou Fancher. Random House, 2013. This beautifully illustrated book takes us on a nighttime tour of the all the sleeping places occupied by the kinds of characters we find only in books and our imaginations – mermaids, pirates, genies, serpents in moats, wizards, unicorns, giants, goblins, dwarves, fairies, and a griffin. The creatures are depicted in a very “realistic” way, but because they are all sound asleep, it’s quite safe for us look at them. Because this book is so beautiful visually, it almost does not need assistance from the the arts to be loved by children and adults alike. But there are some children who need a little extra help in making serpents and goblins a little less frightening. Soft sound effects created by the children to accompany or precede each page may help with that, as well as add another dimension to the book experience. Pirates – (snoring) all children know how to imitate snoring, but you only need two for this! Wizards – (one at telescope, one asleep) talk with the children about the possibility of a shooting star and what it would sound like. Probably there would be no more than two stars falling on any given night. Griffin – what is the sound of snow?! If you have access to a school glockenspiel, 3 or 4 random tones struck very lightly may be just right. One aspect of learning music is that dreaded word, practice. But musicians know that music becomes beautiful only through thoughtful practice, and most of the time they enjoy the hard “work” of practice. Children definitely will not mind “practicing” this book with the sound effects. They might even want to perform it for an audience! Steam Train, Dream Train, Sherri Duskey Rinker, illustrated by Tom Lichtenheld. Chronicle, 2013. This author/illustrator team, well known for Goodnight, Goodnight, Construction Site, clearly knows how to make nighttime safe, interesting and beautiful. This nighttime adventure has vivid color that brightens the soul even while perfectly portraying the darkness of night. In addition, Lichtenheld uses perspective brilliantly, with the “camera” directly on the tracks looking at the oncoming train, inside the train looking out, looking down from above, and a variety of straight-ahead views that heighten or lower the subjects. Movement is also evident everywhere, from leaping rabbits on pogo sticks, to acrobatic monkeys who can use a skateboard while simultaneously juggling and keeping 3 hula-hoops spinning. Camels, kangaroos, turtles, and elephants also achieve athletic professionalism. A couple of dinosaurs make an appearance near the end. The illustrations clearly suggest involvement of the children in many of these movement activities. If space or other conditions pre-empt an entire class miming hula-hooping at the same time (! ), child volunteers would not be hard to find to demonstrate the different kinds of movement we find on these pages. Best of all, these train cars are being loaded with toys, art supplies, and ice cream. And at the end of the train are the flatbed cars that serve as beds for these hardworking train employees. The last page shows a sleeping boy, the dreamer of this dream, with the toy freight train illuminated by the same full moon. The book begins with a mother, arms akimbo and standing in a doorway, observing what looks to be the entirety of her living room totally decked out in all the paint colors available on a Benjamin Moore paint palette. And she makes the perfectly logical declaration: “Ya ain’t gonna paint no more!” But of course our child protagonist figures his mother can’t possibly mean this, and he proceeds to paint all the other rooms of the house and almost the dog (and his own bottom!) until he discovers, to his dismay, there is no paint left. There are hundreds of picture books that beg the participation of young listeners in the reading experience. Whenever you find yourself tapping your foot, feeling the beat of the text, rest assured the children will feel that same beat. Invite them to join you in the refrain, while clapping or patting their knees. When there is description of a setting that excites the imagination, try to find a way to simulate the sounds that would naturally occur in such a setting. If there are characters that have a repeated refrain, let the children speak those words. If there’s a song, let them sing! Most of the time this kind of participation requires repeated readings of the book – the first as an introduction, then as practice, and finally as performance, most often with just themselves as audience. What better way to give real ownership of a book to children?!! Carol Erion is a retired music educator and was Curriculum Supervisor for the Arts, Arlington (VA) County Public Schools. She has served on the Board of the American Orff Schulwerk Assoication, including a term as President, and on their Editorial Board.